A Brownfield is developed real property which may or may not be contaminated or environmentally impacted from prior use. These unknown conditions raise questions standing in the way of the property’s sale or redevelopment, which reduce its value and require investigation and assessment. Examples of Brownfields include former industrial sites, gas stations, dry cleaners, fuel and chemical depots and any other property that used or contained hazardous materials or petroleum. Brownfields also include properties affected by contamination migrating from a neighboring or nearby property. Brownfields may not be contaminated in reality, but suspicion creates stigma that impairs the property’s potential. A Greyfield is developed real property suffering from excess vacancy, prolonged idleness, blight, use failure or even total abandonment—but also possessing (potentially) reusable infrastructure, such as parking lots, utility hookups, or structures. Examples of Greyfields include obsolete retail and commercial properties and abandoned office complexes, as well as mothballed, decommissioned and legacy industrial facilities. Similar to Brownfields, Greyfields may be blighted or in substantial disrepair, but unlike Brownfields they have no known or suspected environmental contamination of any significance. A greenfield is undeveloped real estate with no previous use. Many also consider a property only used for light agricultural purposes to be a greenfield. An undeveloped property may yet have environmental contamination—if, for example, it is adjacent to a property that is leaking hazardous substances across the property boundary—but such a property would not be considered a greenfield and would be better classified as a Brownfield (or possibly a Redfield). A Redfield is real property with known environmental contaminants or conditions that the owner, the government or a reliable third party have determined is in need of remediation as a prerequisite to future development—to mitigate potential human health risks or to comply with environmental laws. Many Redfields are already subject to government regulatory orders or enrolled in voluntary cleanup programs. Unlike a Brownfield, there can be no doubt about whether a Redfield is contaminated. A Redfield is affirmatively known to be contaminated and will likely require active remediation in its redevelopment. Contaminated property could fit into the definition of Brownfield; however, selecting Redfield as the primary statussignals the marketplace that real estate reuse requires corrective action and such remediation is sought. A property with productive use as the primary status is predominately in use at the present time. Properties in productive use may have current tenants generating rents or the owner may be operating the property for their own use. If only a small portion of the property is currently in use, then the lister may select productive use as a secondary condition and would choose a more appropriate primary status. If the property status has not been determined or is unknown by the lister, it may be selected as "undetermined." A Bluefield possesses water resources itself or has access to a navigable body of water such as a river, sea or ocean—either directly or via canal or port. A property with productive use is in some active use at the present time on some portion of the property. Idle or surplus facilities are currently inactive and/or managed as a surplus property, but not decommissioned or demolished. These facilities are monitored and generally well-maintained and could be reused with minimal preparation in a predictable timeframe. Greenfield Acres are undeveloped areas of a partially-developed property that have never been put to use other than perhaps light agricultural production. Many Brownfield, Greyfield and Redfield properties contain areas never put into productive use that remain otherwise unaffected by activities elsewhere on the property or neighboring properties. These kinds of Greenfield Acres are sometimes referred to as “the back forty.”Greenfield Acres can appeal to certain developers, who may see value or potential in using greenfield acreage in a wider site plan. 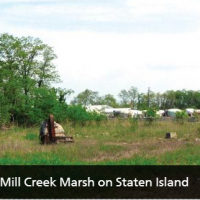 Brownfield Acres are areas of a property with a use history or condition that presents some question as to whether it may be environmentallycontaminated or redevelopment complicated. Many Greenfields, Greyfields and properties in productive use have small areas with lingering questions about potential redevelopment complications. Many legacy properties in use for long periods, for example, have areas in the rear or hidden areas of the site sometimes referred to as the “back dump”—where unregulated dumping took place for decades or more. A Bluefield possesses water resources itself or has access to a navigable body of water such as a river, sea, or ocean-either directly or via canal or port. Some Bluefields can support valuable commercial uses, and many of these commercial Bluefields have definitive access or riparian rights.Many other Bluefields merely provide simple enjoyment for the property owners and tenants. Many bluefields also provide natural habitat to area species or some other ecological service, which could also classify the property as an Ecofield. While a Bluefield may have some acreage underwater continuously, it may also be a bluefield by virtue of temporary water conditions such as seasonal weather patterns (rain or snow melt), tidal forces or stormwater flooding—which could be the result of man-made conditions. Decommissioned facilities are those no longer in working order or whose former use has been decommissioned, removed or demolished wholly or partially—sometimes with regulatory oversight. Some facilities are decommissioned with future use in mind, left behind with care, perhaps with some moderate re-fit and/or redevelopment cost required. Most decommissioned facilities, however, require substantial time and/or capital investment and potentially regulatory approval in order to re-purpose or re-use existing structures and assets. Mineral Deposits can be selected as a secondary condition only if the property contains past, present or potential mines, wells, or Mineral Deposits—or perhaps geologic formations suggestive of the presence of one or more natural resources, such as coal, rock, salt, gold, silver, oil, gas, shale, or any other mineral deposits. These resources should be documented in a third-party report for maximum marketability. A brightfield‘s current use is for solar power generation, or it has been professionally designated for suitability for use as a solar power location; typically verified by one or more third-party reports. Ready Brightfields have some, if not all, utility infrastructure already in place or may simply be near utility lines amenable to solar power distribution. A windfield‘s current use is for wind power generation, or it has been professionally designated for suitability for use as a wind power location; typically verified by one or more third-party reports. Ready Windfields have some, if not all, utility infrastructure already in place or nearby. Ecofield An Ecofield has past, present or potential use as an ecosystem. It may contain habitat for rare, threatened or endangered species—such as wetlands, streams, forest, or prairie. It may also possess ecological assets that provide some ecosystem service to the environment, such as water purification or waste decomposition. Some Ecofields are historic ecological assets interrupted or impaired by development—e.g. being paved over for a parking lot or drained for a field or foundation—but whose ecological potential can be restored or redeveloped. A Multimodal property possesses at least two modes of transport on the property itself or via nearby access. A property with a rail spur and port access, for example, is Multimodal. Most properties in or near air and sea ports are considered Multimodal because they could also accommodate trucks or rail. Many potential Multimodal properties alongside interstate highways, for example, are certified as suitable Multimodal locations by third party site selectors, e.g. in a transportation study. Such documented potential often increases the marketability of a property for Multimodal use. Heritage Site A Heritage Site is a property that has a historical preservation or conservation certification of some kind, or some other archaeological or heritage designation. The best evidence that a property is a Heritage Site would be a letter from a State Historic Preservation Office determining the property’s status or potential impact on other Heritage Sites. Mega-site A Mega-site is a very large property that can be cohesively developed for an integrated, large-scale end use, such as an auto manufacturing plant. A Mega-site must have a minimum of 1,000 acres; completed environmental and geotechnical testing; proximity to interstate highways, and/or railways; and high capacity infrastructure in place or feasibly proximate to the site. Development Park A Development Park is any type of pre-developed area targeted for a specific end use such as a technology park, business park, research park, science park, commercial district, planned community, tourist park or a combination of these. Incentive Zone An Incentive Zone is a specific area targeted with economic development incentives available to spur development, including TIF districts, enterprise zones, opportunity areas, TOD locations, etc. Redfield Acres A property with some areas that have known environmental contaminants or conditions that the owner, the government or a reliable third party have determined is in need of remediation as a prerequisite to development, to mitigate potential human health risks or to comply with environmental laws. Properties whose primary status is Productive Use, Brownfield, Greenfield or Greyfield may have Redfield Acres. Vertical Brownfield A building that is functionally obsolete, underperforming and/or underutilized and that may or may not contain hazardous building materials such as asbestos and lead-based paint. Vertical Brownfields are typical single-use structures, such as an office building in an urban core setting, and candidates for mixes use redevelopment to increase the building's utilization. Clusters of Vertical Brownfields create use monocultures empty and unoccupied at certain times of the day or week (e.g. downtowns empty on nights and weekends). Underutilized Real estate burdened by prolonged idlenessand unable to command market rent. Underutilized properties are often functionally obsolete or impaired by one or more physical conditions that will require remodel or redevelopment. Real estate unrented through multiple real estate cycles may be Underutilized. Real estate operating consistently below capacity or underperforming its comparable market is likely Underutilized. Pre-Demo Real estate with structure(s) burdened by advanced degradation or deterioration, untenable in its current condition and undevelopable. Pre-Demo propertyhas unusable buildings or infrastructure and often need some measure of demolition or deconstruction prior to redevelopment and reuse. Untenable real estate with neglected or dilapidated buildings can sometimes be lawfully ordered to be demolished by the government authorities. Minor or modest demolition is the first step in the redevelopment of many properties. Greyfield Acres Greyfield Acres are areas of a property currently or formerly developed and known to not have adverse environmental impacts. Reusable buildings, utilities or infrastructure are typically present on real estate with Greyfield Acres. Examples of Greyfield Acres include unused parking lots and unoccupied commercial structures. Properties whose primary status is Productive Use, Brownfield, Greenfield or Redfield may have Greyfield Acres. Vacant property A vacant property is devoid of any active use and its buildings are entirely empty of human beings. Vacant lots typically have no structures. Vacant buildings are not occupied and generally do not contain the items, amenities and fixtures customarily found in buildings in use for residential, commercial or industrial purposes. Adaptive Reuse Adaptive Reuse redevelops a previously developed site, building or structure in new construction that utilizes the site and materials on-site for purposes other their original build or design. Airport Access Airports provide access for use by numerous on-site and nearby properties, with some offering dedicated roads or railways for seamless connection with multimodal transport. Green Infrastructure Green Infrastructure mimics, enhances, and/or restores natural functions to better manage water by integrating its flow into the built-environment and create environmental, social and economic benefits. Healthfield A Healthfield is a site that could (or should) be used to improve access to healthcare or to improve the physical and/or psychological health of the community, e.g. for a clinic, community garden or greenway. Historic Preservation Historic preservation, or heritage conservation, refers to efforts to preserve, conserve and protect buildings, objects, landscapes or other built-environments of historical significance. Mine-scarred Mine-scarred properties are those which either have land used directly in mining or share associated waters and surrounding watersheds where extraction or processing of ores and minerals has occurred. Micro-site A Micro-site is a very small property that is not suitable for many kinds of real estate development, a tenth of an acre or smaller, which can be useful as pocket parks or other tactical or interim uses, such as pop-up markets. No Further Action (NFA) A No Further Action (NFA) letter or notice is an official determination issued by the jurisdictionally relevant regulator that a site has been investigated and remediated to the cleanup standard appropriate for the intended use of the property. Also known as No Further Remediation (NFR) letters. Pedestrian Oriented Development (POD) Pedestrian-Oriented Development (POD) is a type of real estate development designed for the maximum utility of the pedestrian, wherein pedestrians are the main design orientation rather than automobile access and parking. Public Private Partnership (PPP) A Public-Private Partnership (PPP) is an agreement between a private party and a government, with centuries of history in real estate, construction and infrastructure development, i.e. the Lancaster Turnpike opened in 1793. Rail Access Access to a railway or rail line via direct connection, rail spur or team track, and potential access, is often sought for its logistical advantages over sites without rail access. Seaport Access Seaports typically provide access for use by numerous on-site and nearby properties, with some offering dedicated roads or railways for seamless connection with multimodal transport. Transit Oriented Development (TOD) Transit-Oriented Development (TOD) is a type of real estate development that maximizes the amount of residential, business and leisure space within the walking distance, or walkshed, of a site with public transportation. 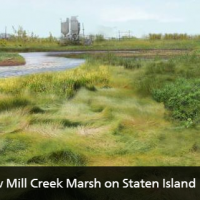 Requesting responses from parties wanting to purchase tidal wetland mitigation credits from the City’s first wetland mitigation bank, the Saw Mill Creek Pilot Wetland Mitigation Bank. So You Just Submitted Your Brownfield Grant Application, Now What? BL is a property marketplace & project workspace for real estate with reuse challenges.